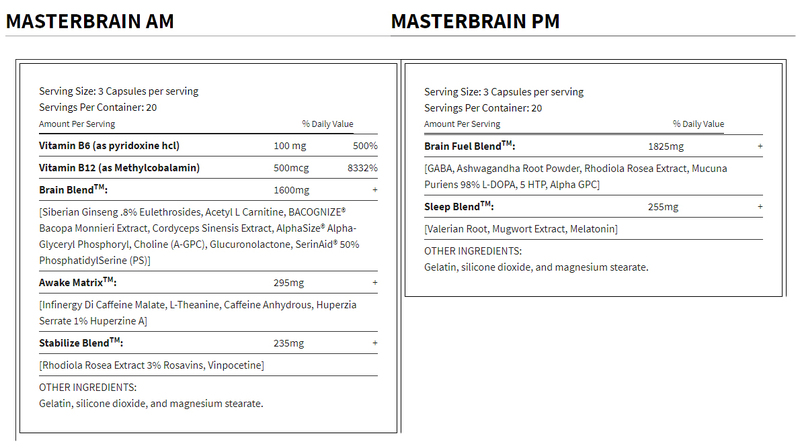 My MasterBrain review is actually a double review, covering both MasterBrain AM, the daytime brain booster, and MasterBrain PM, the nighttime sleep aid. So, I need you to pay double attention, because there are a lot of nootropics and pills and instructions and pros and cons I’ll be throwing at you below. This ain’t a supplement review for the weak or weary. Having said that, aside from the double-stack design of this product, there’s really not too much that’s unusual about MasterBrain. Funny enough, this was one of my easier reviews, the final judgment being (spoiler alert) MasterBrain is good. But how good? And good how? Let’s read the MasterBrain review to find out. By 1st Phorm, MasterBrain is a double-stack nootropic product that splits into a daytime AM brain booster and a nighttime PM sleep aid. MasterBrain AM: Caffeine, anxiolytics, adaptogens and more — the AM formula energizes while calming anxiety for relaxed focus. MasterBrain PM: Melatonin, dopaminergics, and serotonergics — the PM formula lulls the brain to sleep with feel-good relaxation. Proprietary blends abound: MasterBrain hides the individual ingredient dosages beneath proprietary blends. Annoying, but could be much worse. Directions: Take three (3) capsules of MasterBrain PM at night with a minimum of 16 ounces of water about 45 minutes before you want to fall asleep. Be sure to take when you have eight (8) hours to devote to restful sleep. Compare my supplement facts to the image above, which I screenshot from the 1st Phorm website. I’m not that much of a grammar Nazi… but that’s pretty bad. Comes across super sloppy. But none of that matters, so long as the ingredients work. So, let’s check out the ingredients, y’all. Vitamin B6 (as Pyridoxine HCl) – Decent dosage, okay form (P-5-P is better). B6 improves mood and cerebral circulation, reducing homocysteine damage on brain blood vessels. More on Vitamin B6. Vitamin B12 (as Methylcobalamin) – As we age, natural B12 levels decline. Bummer because B12 plays a key role in over a hundred metabolic pathways. MasterBrain has a good dosage of good quality B12. More on Vitamin B12. Siberian Ginseng Extract – Powerful Northeast Asian adaptogen for combating stress and potentially improving athletic performance. MasterBrain supplies Siberian Ginseng in potent extract form. 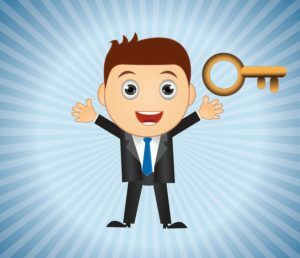 Acetyl-L-Carnitine – Viewed as a sort of brain energizer, ALCAR seems to work by increasing fatty acid metabolism in mitochondria, enhancing ATP energy output. More on ALCAR. Bacopa Monnieri (as BACOGNIZE®) – Awesome Ayurvedic adaptogen for memory and learning. Bacopa improves various measures of high-order cognitive processes, making it particularly useful for students. More on Bacopa Monnieri. Cordyceps Sinensis Extract – Mm larva fungus. 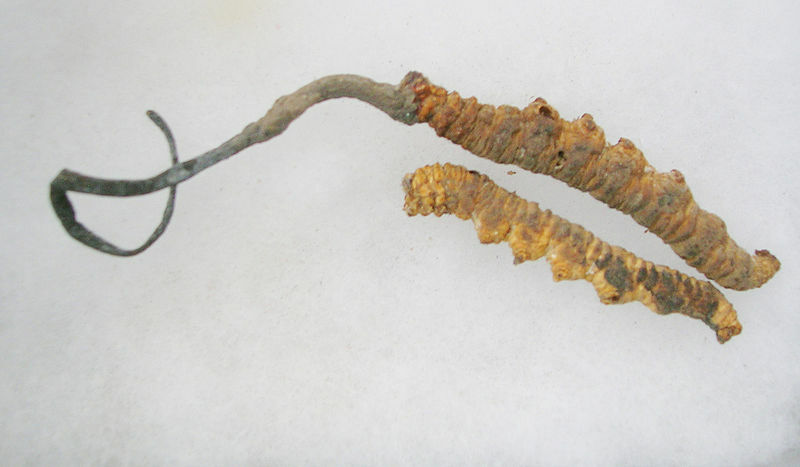 Cordyceps are interesting, potentially improving energy and stamina. Might possess ergogenic benefits. Alpha-GPC (as AlphaSize®) – A premium quality brand of alpha-GPC, a supplier of choline, which converts to phosphatidylcholine and neurotransmitter acetylcholine. More on Alpha-GPC. Glucuronolactone – Energy drinks favor this compound for some unknown reason, judging by the lack of clinical research backing this ingredient. I’m curious what MasterBrain sees in glucuronolactone. Potentially a waste of capsule space. Phosphatidylserine (as SerinAid®) – Premium quality brand of a key phospholipid required in the cell membrane bilayer. As a nootropic, PS seems to improve memory, clarity, and cognitive longevity. More on Phosphatidylserine. DiCaffeine Malate (as Infinergy™) – Caffeine fused with malic acid by Creative Compounds LLC. Claimed to boost mental focus while also stimulating thermogenesis. L-Theanine – A smart complement to caffeine, L-theanine reduces the jittery side effects of stimulants while maintaining the boosts on focus and energy. If anything, L-theanine further improves the focus benefits with its own focus sharpening effects. More on L-Theanine. Caffeine Anhydrous – Straight-up caffeine, the world’s favorite drug. Not a true nootropic, as caffeine can potentially diminish cognitive performance. Yet, MasterBrain’s L-theanine helps control caffeine’s benefits. More on Caffeine. Rhodiola Rosea Extract (3% Rosavins) – One of my favorite adaptogen nootropics, Rhodiola works by reducing stress and fatigue, acutely increasing cognitive clarity and stamina. 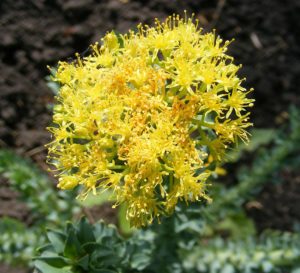 More on Rhodiola Rosea. Vinpocetine – Another semi-synthetic compound that seems to increase cerebral circulation for better delivery of oxygen and nutrients to the brain. More on Vinpocetine. GABA – As a neurotransmitter, GABA is responsible for combating excitatory brain activity, lulling the brain to relax or even sleep. Yet, as a supplement, GABA doesn’t do much of anything, as it’s unable to sufficiently cross the blood-brain barrier. Ashwagandha Root Powder – Powerful, popular adaptogen for combating stress and anxiety. Ashwagandha’s a bit of a sedative, perhaps too much of a sedative for some, but its calming benefits are groovy nonetheless. More on Ashwagandha. Rhodiola Rosea Extract – See entry above. Mucuna Pruriens (98% L-DOPA) – A rich concentration of natural L-DOPA, the precursor to feel-good neurotransmitter dopamine. May also improve LH/FSH activity for increased testosterone in men. 5-HTP – A serotonin and melatonin precursor, 5-HTP seems to assist with mood and sleep. However, if you’re already on serotonergic drugs, 5-HTP supplementation may not be recommended. More on 5-HTP. Alpha-GPC – See entry above. Valerian Root – An ancient remedy for sleep issues, modern uses of valerian seem primarily related to improving sleep quality. Valerian seems to work modulating GABA receptors. More on Valerian. Mugwort Extract – Referred to as the “Dream Plant,” mugwort seems to not only improve sleep quality but potentially dream vividness as well. This is somewhat a popular nootropic herb among lucid dream seekers. Melatonin – Hugely popular ingredient for sleep enhancement, melatonin essentially tells the brain “okay, time for bed!” However, many mainstream sources use synthetic melatonin, as opposed to standardized extracts of natural melatonin. MasterBrain seems to be on the synthetic side here. I’m running out of time 24/7! 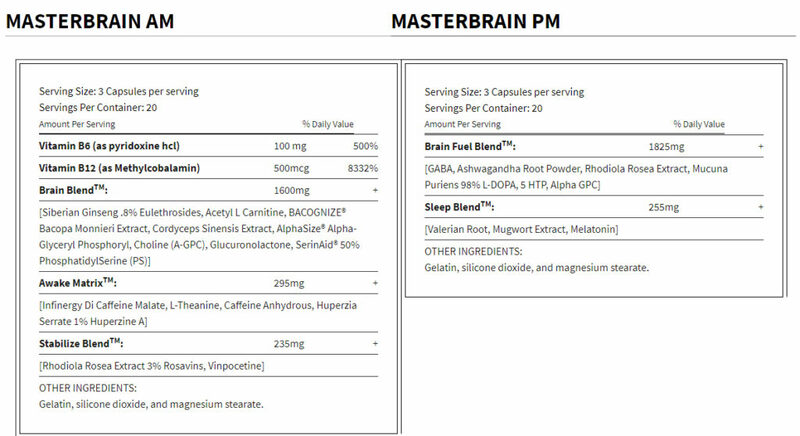 Hm, well… okay, MasterBrain doesn’t exact supply 24/7 cognitive enhancement but rather 24/5 brain boosts, considering both AM and PM stacks only supply 20 servings per bottle. Thus, to get a month’s worth supply out of this stuff, you’ll need to take only five servings of each per week. Having said that, the 24 hour part still holds, as MasterBrain covers both daily cognitive enhancement and nighttime sleep quality improvements. And if you’ve ever slept before, you’ll know that sleep feels really good on the brain. But enough of all that. All we really want to know here is: Is MasterBrain any good? I found the key to enhanced cognition: sleep! Most nootropics make sense in both AM and PM stacks. The ingredients come in high quality, potent forms. MasterBrain’s caffeine is offset by L-theanine and stress-reducing adaptogens. 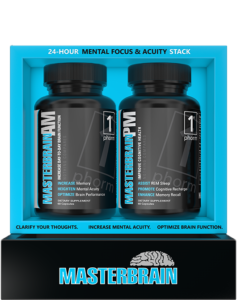 Altogether, MasterBrain AM and PM are pretty impressive nootropic stacks, accomplishing significant brain boosts for both short-term and long-term cognitive enhancement. And by avoiding the synthetics and risky stimulants, MasterBrain reads like a truly healthy, natural brain health supplement for the nootropic enthusiasts who take their health seriously. So… okay, sure, yes, MasterBrain is a good supplement. MasterBrain ingredients generally come in high quality, potent forms for enhanced bio-availability and, thus, bio-efficacy. For the most part, the ingredients make nootropic sense in both the AM and PM stacks. Caffeine isn’t a true nootropic, yet MasterBrain complements its caffeine well with relaxing anxiolytics and adaptogens. The proprietary blends are a bummer: what are the ingredient dosages, my doods?? Some ingredients could be removed or replaced, such as GABA and glucuronolactone. You are getting two supplements here, so you can expect a higher than average price. Even so, it’s a bit annoying that you’re only receiving 20 days’ worth of MasterBrain here. Technically, the price per serving comes out to $2.00 per serving, if we’re looking at AM and PM individually. However, I’m lumping the AM serving with the PM serving for one daily serving, as that’s how you’re directed to supplement MasterBrain in toto. Opting for 1st Phorm’s EasyPhorm™ auto-subscribe order option doesn’t seem to save you any money, so… buy whichever your beautiful heart desires. MasterBrain reads like a high quality version of your run-of-the-mill brain boosting “enhanced work productivity” supplement. Some nootropic users prefer to limit their caffeine intake and might be turned off by MasterBrain’s caffeine content alone. But anyone looking for a daily pick-me-up as well as a nighttime put-me-down may find value in MasterBrain’s AM + PM doublestack design. 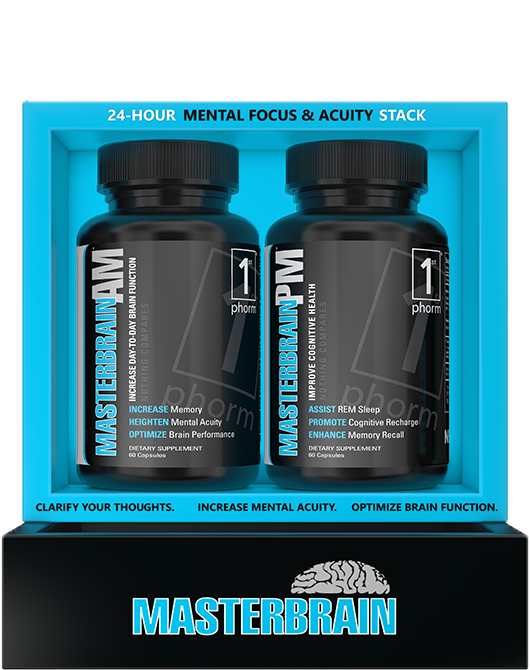 You can buy MasterBrain through the 1st Phorm website. Amazon currently has a MasterBrain AM + PM listing… but it’s out-of-stack. So, as far as I know, you can only buy MasterBrain through the manufacturers website. Yes. MasterBrain AM works for daily cognitive energy, focus, stamina, and memory. Yes. MasterBrain PM works for nightly cognitive relaxation and sleep enhancement. What more do you need to know?? Perhaps if MasterBrain could work better? Yeah, I think that’s a fair question, and the fair answer to that: sure. It’s by no means a perfect supplement. Yet, while I’m annoyed by a few ingredient choices and the company’s use of proprietary blends, MasterBrain does more than enough to justify a good review. And that’s essentially what it gets by me: a good review by the one and only Nootropic Geek, baby. If you’d like to read more of those, I recommend checking out my Best Nootropic Supplements of 2018.